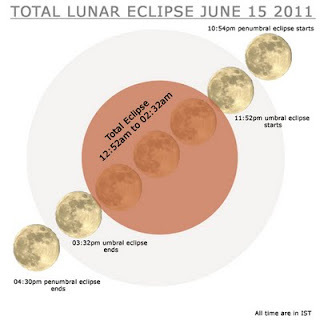 A total lunar eclipse will take place on June 15, 2011. 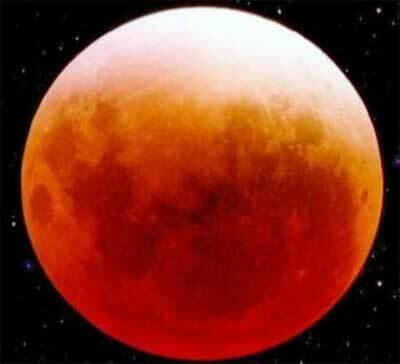 It is the first of two total lunar eclipses in 2011, the second occurring on December 10. It is a relatively rare central eclipse where the moon passes in front of the centre of the Earth's shadow. The last lunar eclipse closer to the centre of the earth's shadow was on July 16, 2000. The next central total lunar eclipse will be on July 27, 2018. It will be visible completely over Africa, and Central Asia, visible rising over South America, western Africa, and Europe, and setting over eastern Asia. In western Asia, Australia and the Philippines, the lunar eclipse will be visible just before sunrise. Penumbral Eclipse Begins: 17:24:33 UT Partial Eclipse Begins: 18:22:55 UT Total Eclipse Begins: 19:22:29 UT Greatest Eclipse: 20:12:35 UT Total Eclipse Ends: 21:02:41 UT Partial Eclipse Ends: 22:02:14 UT Penumbral Eclipse Ends: 23:00:44 UT. Eclipse Time IST in India: 11.52 pm to 3.32 am night of June 15. Mid Eclipse is at 1.42am on 16th. The moon is completely covered by Earth Shadow (Total Eclipse) from 12.52 am to 2.32am on June 16 early morning. ** India Don't follow Day light savings Time! Eclipses, including total solar eclipses, have been the subject of superstition and scientific curiosity throughout history. There was a time when some cultures dreaded eclipses, but many people look forward to their occurrence in modern times. explores how a total solar eclipse works and briefly examines other types of eclipses, including lunar eclipses. Due to the atmospheric refraction moon may appear dark brown and red to bright orange and yellow depending on the amount and type of dust present in the atmosphere. The total lunar eclipse, which occurs when the moon’s travels completely into the earth’s umbra. The moon never complete disappears during a total lunar eclipse. The partial lunar eclipse, which occurs when the moon is oriented in a way that only part of it dips into the earth’s umbra. The penumbral lunar eclipse, which occurs when the moon passes through the faint penumbral portion of the earth’s shadow. There is always a full moon on the night of a lunar eclipse. The eclipse’s type and length depends on the moon’s location relating to its orbital nodes (one or two points where an orbit crosses a plane of reference that it is inclined to). A lunar eclipse has two magnitude values – the penumbral magnitude and the umbral magnitude. 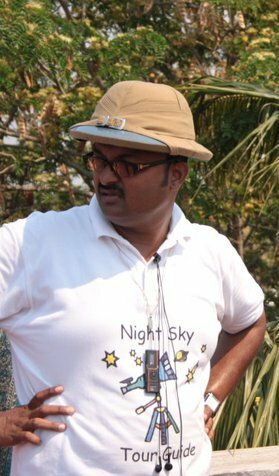 The readings can be taken from observing through naked eye, binoculars and small telescopes. Hope we all get chance to observe, enjoy and photograph the event.